Air conditioning enhanced my liveaboard experience in Florida. It would have been a miserable experience without it. In fact, it WAS miserable until I wised up and installed AC. I am limiting my discussion here to smaller liveaboard boats, say those in the 40 foot and under range. Larger boats and megayachts have huge interior volumes and require special design consideration beyond the scope of this website. This is a unit that will fit into most standard size rectangular deck hatch openings. They usually have a canvas hood to help seal off the opening. They are small enough to be stowed below until needed. The unit I installed on my CSY33 was 5000 BTU and I put it in the hatch directly over my vee berth in the bow of the boat. The unit would keep the forward stateroom cool without difficulty, but I had to keep the door to the room closed. The unit did not have the oomph to cool the entire boat. Other than the constant humming noise, it worked out pretty well since I worked during the day and was seldom on the boat during the hottest hours of the day. These units can be bought at any Home Depot or Walmart and usually range from 5000 to 16000 BTU. They can be mounted in a deck hatch or in a companionway hatch with some carpentry work usually required to make them fit properly. 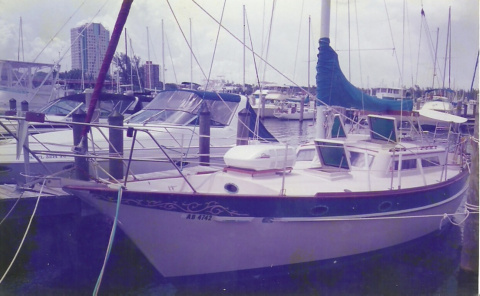 On my Island Packet 26MKII I had one mounted low in the companionway hatch. The hatch was very large and its sill was almost down to the cockpit sole. I was able to make a plywood insert for the hatch that accomodated the AC unit but still enabled easy entrance into the boat by stepping over the unit. This unit on my boat was 5000 BTU and it kept the entire boat comfortable below during even the hottest and most humid days of the Florida summer. While in the marina, I kept the unit running 24 hours a day and the electrical bill was never more than about $30 in any given month. This kind of unit stays put wherever you choose to install it on the boat. All of the parts that make it work are in a single box and you bolt it in under a bunk or in a storage locker or wherever you have the space. This unit requires through hull connections to draw cooling water into the unit and to discharge the cooling water overboard. Ducts are normally installed from the unit into the various rooms of the boat. In smaller boats only one duct is typically required from the unit to the forward or after stateroom, with the main vent from the unit itself discharging cooled air into the area where it's installed. Some self contained units can also heat the boat either through a reverse cycle process or with a heater element. Some of the bigger yachts require a split system that has two or more air conditioning units located at different areas in the boat. Other yachts may use a chilled water system that cools or heats fresh water and circulates it to air handlers throughout the boat. West Marine and other online sources can help you design the air conditioning system for your own liveaboard boat. When living aboard in Florida, I usually found Memorial Day weekend in late May to be just about the right time to button down the hatches and crank up the air. It then stayed on most of the time until sometime in October. Air conditioning is easy to install and operate if you are living aboard in a marina. 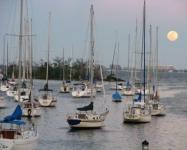 The electrical demand can be easily met by the marina's shore power. A typical 5000-16000 BTU window type unit will draw between 4 and 13 amps. No sweat in a marina, but a big energy draw if you are on the hook or on a mooring. Away from the marina you will need either a huge battery bank and inverter or a generator. In Florida, the hot humid weather and abundance of biting insects may encourage you to make the investment under any conditions.